<!- body goes here -> "The Art of Nick Cardy" is available again in major release!!! 12/19/01 - John forwarded to me the press release announcing the new publication is available. 1/14/01 - John has informed me the book will be reprinted by Vanguard Productions. 12/22/99 - I got my book. Now you get yours. Read my review. 11/16/99 - John has informed me the book is due in mid-December and turned out to be 176 pages. Art of Nick Cardy in Major Release Through Vanguard! COMIC SHOP NEWS #752 states, "...one of the finest creator-focused appreciations the field has seen." Cleveland Plain Dealer newspaper (12/22/01) states, "One of the nicest comics-art books I've seen,..."
Nick Cardy has been both a creative and dynamic artistic force within the comic book industry for over 50 years. Beginning in 1939 with the Eisner/Iger shop, through newspaper strips (i.e., Tarzan), his almost 25 year association with DC Comics and on to magazine and movie poster illustration, Nick Cardy�s career spans from the Golden Age to the present. As well as being one of DC Comics� top cover artists, fans will remember that in the 1960s Nick Cardy helped define comics� Silver Age with stunning sequential artwork on such titles as Aquaman, Teen Titans, and Bat Lash. The artist�s contributions to the industry earned him the prestigious "Ink Pot Award" for Outstanding Achievement in the Comic Arts. Earlier in 2001 both Nick and author John Coates decided to re-publish the book for the mass-market. Vanguard Publication�s success with similar products including Amazing World of Carmine Infantino, Neal Adams: the Sketch Book, Drawings of Michael Wm. Kaluta, The Jeffrey Jones Sketchbook, STERANKO: Graphic Prince of Darkness and The Al Williamson Sketchbook made the New Jersey based publisher Cardy� and Coates� first choice to handle the project. 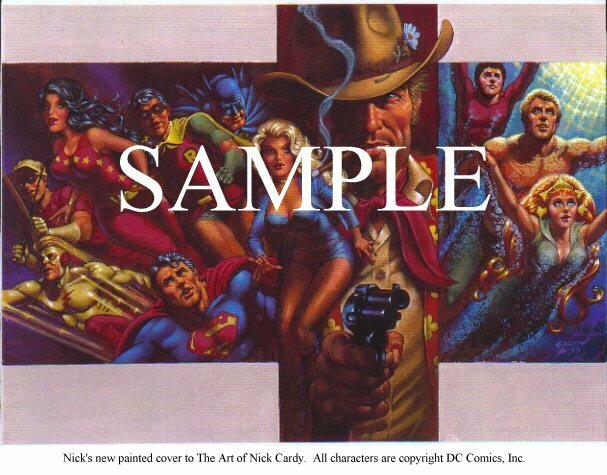 The Vanguard Art of Nick Cardy editions are produced with a new back and front cover, updated index, in multiple editions including a softcover ($19.95), hardback ($29.95), and Vanguard�s trademark, gold-foil embossed, leatherette, signed & numbered, deluxe hardback ($39.95) featuring a 16-page bonus portfolio, ...not found in other editions! All three Vanguard editions are available through your local comic book store or can be ordered direct from Vanguard Publications (http://www.creativemix.com/nickcardy/). Also, the soft-cover edition is available through mainstream bookstores everywhere and online through Amazon.com and Barnesandnoble.com! Author John Coates originally self-published the book as a limited edition paperback in the Winter of 1999. That soft-cover edition was signed & numbered by Nick Cardy, limited to a print run of only 1,000 copies and sold-out within 6 months of its publication. That edition was not distributed via the mass market and only available through mail order. The book, expertly designed by Comic Book Artist magazine�s Jon B. Cooke, received critical acclaim by the comics� media, professionals and fans alike. This appreciation culminated in the book being nominated at the prestigious Eisner Awards 2000 for Best Comics-Related Book. The new release is coming soon!!! Nick Cardy has been both a creative and dynamic artistic force within the comic book industry for over 50 years. Beginning in 1939 with the Eisner/Iger shop, through newspaper strips, his almost 25 year association with DC Comics and on to magazine and movie poster illustration, Nick Cardy�s career spans from the Golden Age to the present. As well as being one of DC Comics� top cover artists, fans will remember that in the 1960s Nick Cardy helped define comics� Silver Age with stunning sequential artwork on such titles as Aquaman, Teen Titans, and Bat Lash. The artist�s contributions to the industry earned him the prestigious "Ink Pot Award" for Outstanding Achievement in the Comic Arts. Cardy along with author John Coates, have signed with art book publisher Vanguard Productions to produce for wide release, the critically acclaimed, Art of Nick Cardy. Vanguard�s success with similar products including Amazing World of Carmine Infantino, Neal Adams: the Sketch Book, Drawings of Michael Wm. Kaluta, The Jeffrey Jones Sketchbook, STERANKO: Graphic Prince of Darkness and The Al Williamson Sketchbook made the New Jersey based publisher Cardy� and Coates� first choice to handle the project. Vanguard hopes to premier the book at the 2001 Comic-Con International convention and is scheduled to be in comic shops by late Summer and major bookstores including Barnes & Noble and Borders Books by Fall of 2001. Author John Coates originally self-published the book as a limited edition paperback in the Winter of 1999. That soft-cover edition was signed & numbered by Nick Cardy, limited to a print run of only 1,000 copies and sold-out within 6 months of its publication. That edition was not distributed via the mass market and only available through mail order. The book, expertly designed by Comic Book Artist magazine�s Jon B. Cooke, received critical acclaim by the comics media, professionals and fans alike. This appreciation culminated in the book being nominated at the prestigious Eisner Awards 2000 for Best Comics-Related Book. Long-time DC Comics artist and publisher Carmine Infantino said, "It�s not an understatement that one of my greatest pleasures in this industry is having known Nick and his work. He deserves every accolade." The Vanguard book will be produced in multiple editions including a hardback, as well as Vanguard�s trademark, gold-foil embossed, leatherette, signed & numbered, deluxe hardback featuring a 16-page bonus portfolio, not found in other editions! "Nick and I are thrilled!" stated author John Coates. "J. David Spurlock of Vanguard Productions is well known for producing quality work. We couldn�t be happier." Coates continued, "Since the book went out-of-print I�ve been inundated from collectors and retailers, including Bud Plant Comic Art, all eagerly seeking copies of the book. The Vanguard deal is a win-win for retailers, historians and fans alike." Vanguard publisher Spurlock added, "In discussing this deal we all agreed that it was important to respect the fans who purchased the original release. If anything, I think those fans will be even more pleased with having purchased that book, given its original low price-point and first edition value in today�s collectible market. This book is just too important not to have mass-market distribution." The Art of Nick Cardy is coming!!! June/99 Heroes-Convention program/booklet:Full Page ad. July/99 COMIC BUYERS GUIDE #1338: Super-trader & classified Ad. July/99 COMIC BOOK ARTIST Magazine #5: 1/4 page ad. Aug/99 San-Diego Comic-Con International program/booklet: 1/2 page ad. PLEASE READ: Any profits from the sale of this book will go to Nick Cardy, NOT Coates Publishing, Inc. No advance orders will be taken via email. Canada & Non-continental United States orders send $7 postage per book. If outside of continental United States please send International Money Order only, No Checks. Credit cards not excepted. Please do not send cash.